Yesterday's patch brought with it an interesting little surprise. When you change character, the one you most recently logged out of shows up from a position that's much further zoomed out than the usual portrait view that just shows your character's face and most of their upper body. However, when you then select another character it resets to your normal point of view, even if you go back to your original selection. There's a thread on the forums about it that's already 13 pages long and in which it's suggested that it's a bug... but a lot of people are also saying that they kind of like the new view and how it lets them see more of their character and their ship. My personal guess is that this is related to the display bug that's existed pretty much forever and which would show your character's portrait a bit further down the screen than expected when you relogged, making them look like they had shrunk. It looks like someone finally tried to fix this issue, but instead of truly fixing it, they caused... this. At least it looks less silly this way, even if the sudden change of perspective is still strange. The only bit of dissatisfaction I have with the 'new' view is that some of them aren't accurate. Take the image of a Trooper aboard their BT-7, as in the example above; in the actual ship, the rear bulkhead of the control cabin is flush against the near edge of the control panel you see just to the left of the character's elbow; where the character is standing would 'realistically' be at the top of the stairs leading down into the control cabin, and with most of the view blocked by the bulkhead between the character and the control cabin, it wouldn't be much of a view. Similarly, the Agent's ship has the control cabin rendered much wider than it actually is. Still, nit-picking accuracy isn't as important as giving a 'feel' for the character on the selection screen, and I'd prefer for the 'bugged' view to be made the default, or at least have a little [+] icon to zoom between this view and the 'correct' view with the game remembering the last-used setting. Listen to my guildie on TOROCast! 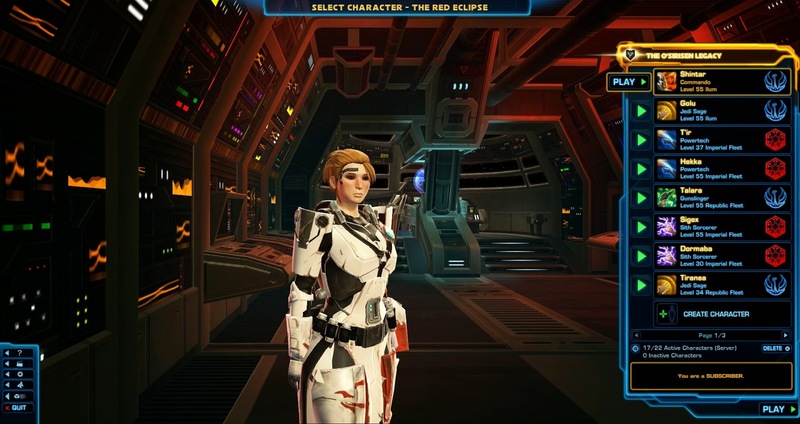 Do you consider SWTOR "old"?